An ambitious Australian project has recently emerged. 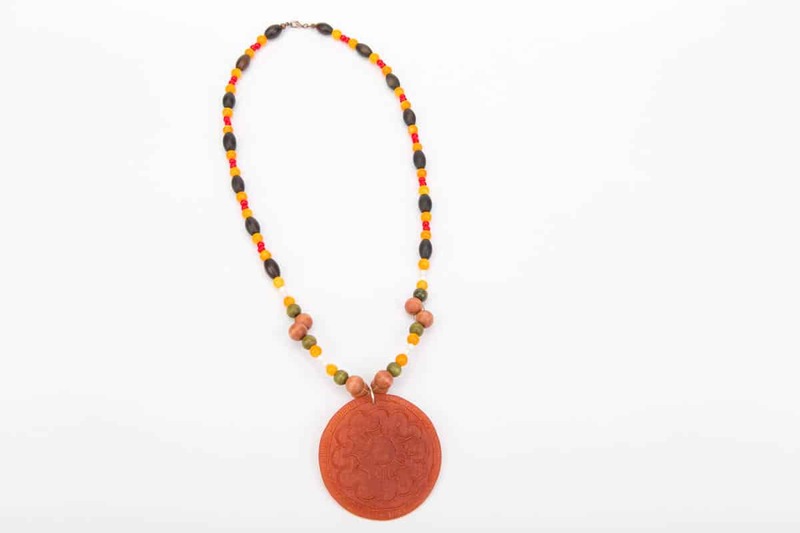 The Indigenous Jewellery Project was initiated by Emily McCulloch Childs and to date has involved Melanie Katsalidis, Kate Rohde and Melinda Young. We learn from Emily about its origins, values, methods and future ambitions. She is interviewed by Kevin Murray, Managing Editor of Garland. Garland: How was the project was conceived? Emily McCulloch Childs (EMC): This project came about through an evolving interest in Aboriginal jewellery and contemporary jewellery. Early on, I was inspired by the exhibition Art on a String curated by Louise Hamby and Diana Young for Object in 2001. It to date is the only considered widely-focused Aboriginal jewellery exhibition and catalogue done in depth. Researching Aboriginal women’s art, I became interested in the long (probably the oldest in the world) tradition of Aboriginal jewellery. I was also friends with several contemporary jewellers and contemporary jewellery curators in Melbourne, and we would often have long discussions about contemporary jewellery and Aboriginal art, wherein we would learn from each other. I have been collecting Aboriginal jewellery from around Australia for about 15 years. Every time I visit events like Desert Mob, the Darwin Aboriginal Art Fair, and the Cairns Indigenous Art Fair, I collect jewellery. I always am impressed by Indigenous jewellers skills and design abilities. Two necklaces I have from the NPY Lands (Ngaanyatjarra Pitjantjatjara Yankunytjatjara region in Central Australia) particularly inspired me. They are painted quandong seeds, in very bright, contemporary colours. No artist was noted on their label. Part of this project is to identify Aboriginal jewellers, as Art on a String noted, so many are just anonymous. I could see also how great these quandong seeds would be cast in resin, which was the reason we started working with Kate Rohde. Working in the field of Aboriginal art, I began to see a real gap within the field of contemporary jewellery. I’ve taken to calling it ‘the last great medium’ of Aboriginal art. Most other mediums, from painting, to weaving, sculpture, printmaking, ceramics, new media, etc., are very well-represented by Aboriginal & Torres Strait Islander artists, but only a handful of concerted contemporary jewellery projects have been undertaken. One was a project with the Tiwi Art Network with Melbourne jeweller Ali Limb, which really inspired me. The work produced in silver was really beautiful. I could see the potential for indigenous artists to upskill their work into a more fine art, contemporary jewellery level. Through working with good curatorial drive and passion and great contemporary jewellers and object makers, I knew these artists could produce some really exciting, interesting art jewellery. After making contact with Melanie Katsalidis of Pieces of Eight Gallery, who also saw the need for this sort of project, we began working with Kate Rohde. I helped Erub Erwer Meta art centre in the Torres Strait Islands to get Australia Council funding to send Kate up for two workshops. They fuse their ghost net weaving jewellery with resin. 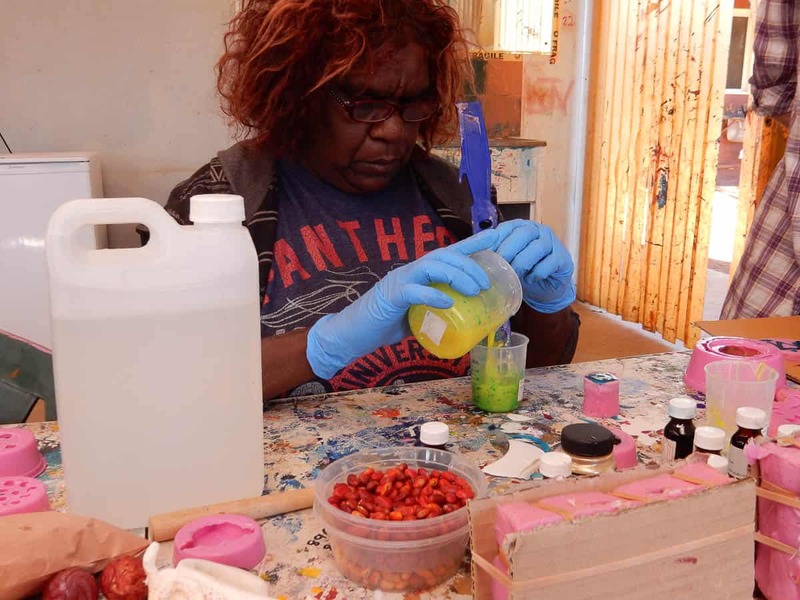 Kate Rohde and I ran workshops in resin and lost wax at Ernabella Arts (Anangu Pitjantjatjara Yankunytjatjara Lands, SA) and Ikuntji Artists (NT). 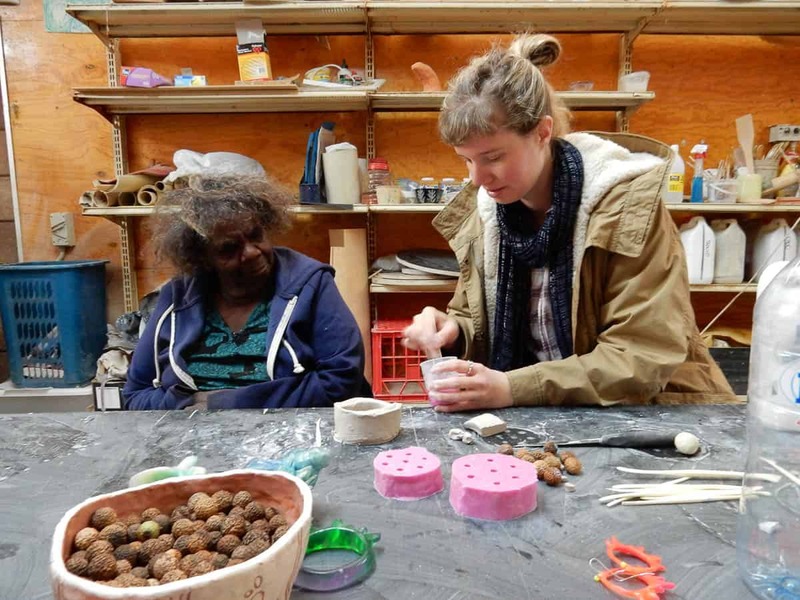 The work produced in these workshops was shown at the JamFactory in the exhibition Jewellery has always been here as part of TARNANTHI. Garland: What does “upskilling” involve? What do you think may be the meaning and function of contemporary jewellery in a remote Aboriginal community like Ernabella? EMC: Our aim is to give these jewellers the materials and support—the opportunity to work in a more fine art context. It has been done in every medium except jewellery: it’s been done in painting, ceramics, printmaking, sculpture, weaving, photography, new media, so why not in jewellery? It really is long overdue. These jewellers don’t have the opportunity to study at art schools in metropolitan cities, so we bring the art school to them. The workshops are a very intensive course in jewellery technique, using correct tools and professional materials, but also focused on maintaining tradition and passing on skills. Aboriginal jewellers are perfectly placed to be contemporary jewellers. As you have written Kevin: contemporary jewellery is defined by connection to place. These jewellers’ work is all about their country: the materials, such as native seed beads, are gathered on country and relate to ancestral country and totemic ancestors. This is part of the artist’s identity. The Ernabella concept of walka: special design relating to an artist’s country and identity, has great application for contemporary jewellery, wherein design is personalised by its maker. Ikuntji artist Virginia Ngalaia Napanangka’s work, such as her Western Desert Series is all about the symbolic totemic creation animals of each major site in the Western Desert, and her movement westwards through marriage to a Pintupi man from Kintore. It is highly conceptual: I believe Aboriginal artists are great conceptual artists: and this applies to their abilities with contemporary jewellery making also. Additionally, Ernabella artist Niningka Lewis recorded endangered and extinct animals from her country in her work she did with us: this was used in the art centre during the workshops to teach children, the artist’s children and grandchildren, about these animals. 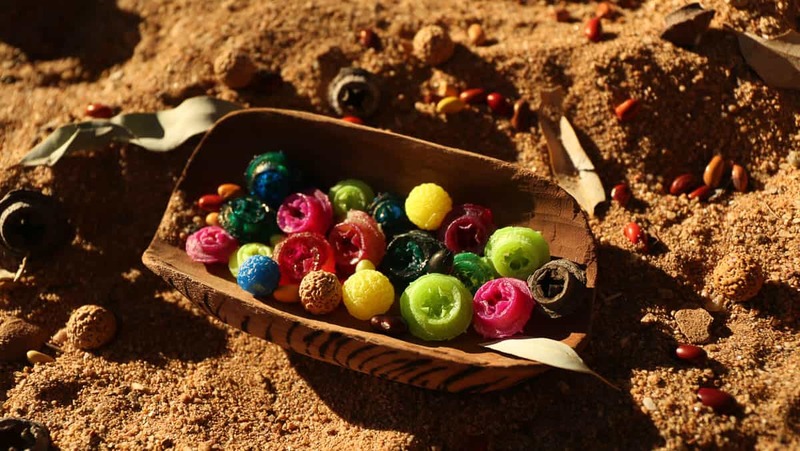 This project not only teaches new skills but also led to an interesting revival in tradition: at both Ernabella and Haasts Bluff, jewellers started making lots of what are called “bush jewellery”: necklaces in gumnuts, ininti and other native seeds. All of a sudden, these art centres were filled with this beautiful bush jewellery. The way it spread like wildfire was so inspiring and surprising to see: how if someone from outside, and the art centre, take an interest in an area of art, the artists will respond so well. At both art centres, jewellers came in who had never really come into the art centre before. I believe there’s a whole group of jewellers aren’t there with real skill and talent, just waiting in the wings for this kind of opportunity! Last November, Pieces of Eight jeweller Melinda Young and I ran a two week jewellery workshop at Ernabella Arts. We have just had an invitation from the NGA Shop to stock some work so that is an exciting promise for the future of these artists as contemporary jewellers and small object makers. We are finding a lot of demand for this work particularly in the Aboriginal galleries, more than we are able to produce, as one of the reasons I began the project was because of the huge gap I saw, where there was really no consistent contemporary jewellery in the Aboriginal art worlds, apart from Lola Greeno, who was a real inspiration. 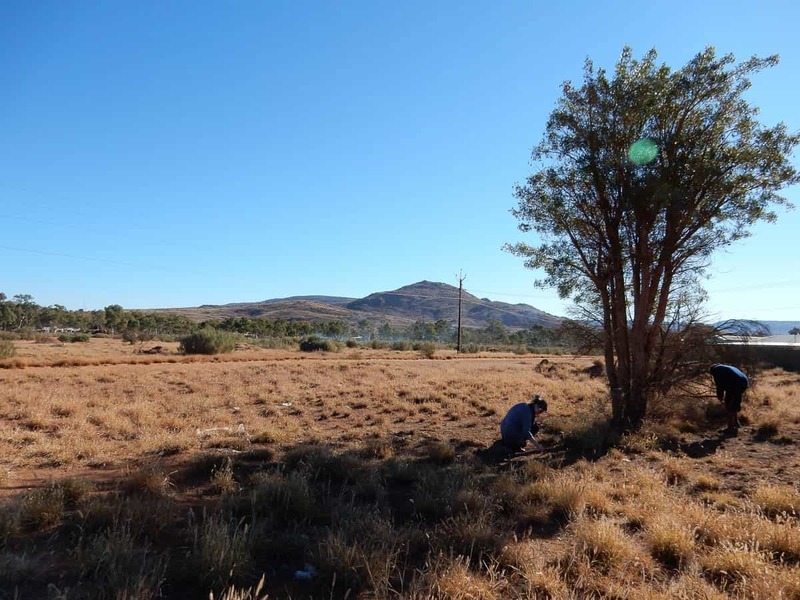 More recently we have of course seen Vicki West, Maree Clarke, Jason Wing, and there has been a silver project in Arnhem Land with Zoe Crowder, but not really anything from these areas: the APY Lands, Western Desert in particular. 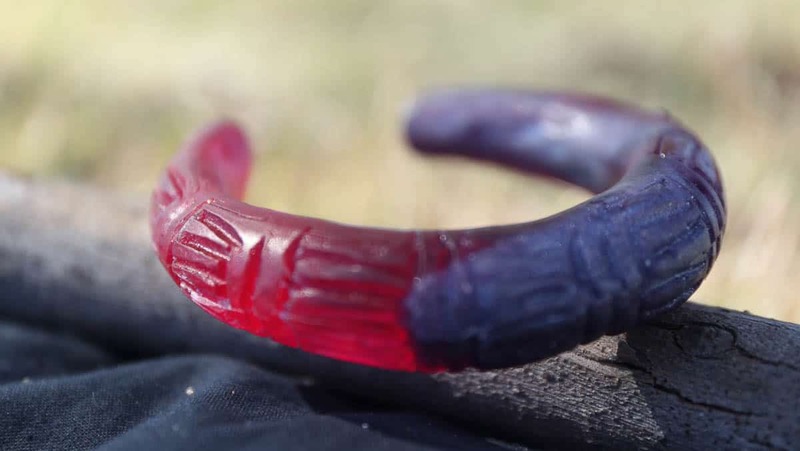 A huge part of this project was in identifying these jewellers and bringing forth their biographies and traditions, as well as working with them on new innovations, as is done in non-Indigenous contemporary jewellery and with say Aboriginal painting. As a collector I have a lot of anonymous jewellery and as an artist biographer, the artist is important to me. Everything we do (in the multi-faceted art company I run with my mother, Susan McCulloch, especially because we are art historians, is about personalising the artist as much as possible and undoing the colonial hangover of the “Anonymous Aboriginal Artist”. Indigenous jewellers have their own skill sets, designs, techniques and artistic creativity in their jewellery work just like they do in their other mediums, and this was a huge impetus for me in researching and doing films, etc. I was also becoming tired of beautiful necklaces that broke! Hence the upskilling. Garland: I’ve watched and considered your beautiful videos. It was great to get so much speaking to camera. It was clearly a sign of trust that the participants had in your project. I was also wondering: what do you think was special in the way the Aboriginal artists in Ernabella approached the use of resin in jewellery? EMC: The background of Ernabella artists as punu (wood) carvers and their ceramic work was as important as their jewellery skills. Having an artist like Niningka Lewis who is unusual and experimental was important and having younger artists like Marissa Thompson who has a real skill for resin work was invaluable. The Ernabella tradition of walka (design) lends itself perfectly to mark making on clay or plasticine for making masters for resin. The ability of these artists to create small figures for casting and to gather seeds for beads was invaluable for resin. 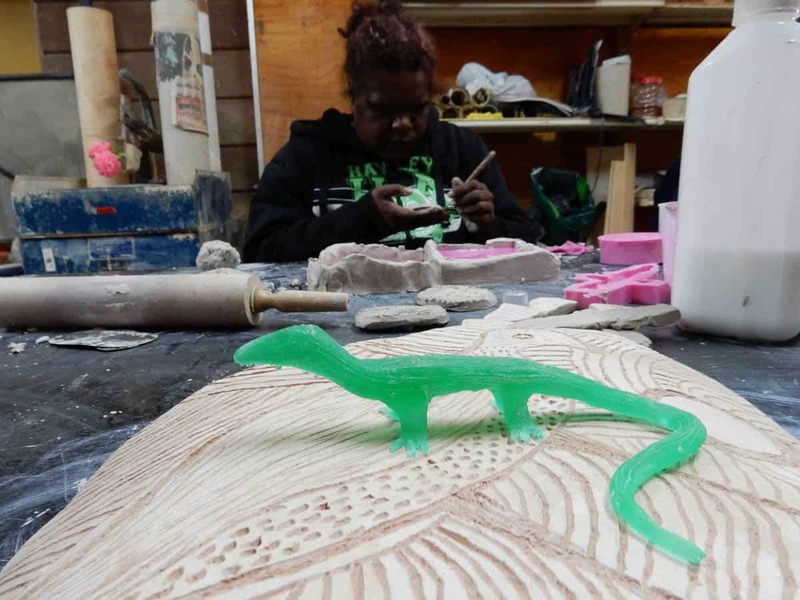 The same goes for Ikuntji Artists: Virginia Ngalaia Napanangka, one of our most talented artists at Ikuntji, had a background from Hermannsburg—in fact her grandparents founded Hermannsburg Potters. She has an innate skill with clay. So when it came to resin, it’s really the same thing: it’s shaping in clay. So this was a perfect match. It’s much easier and more practical than glass for these remote art centres to work in. And they can also mix it with other materials easily. When we were making the films one of the artists at Ikuntji, Alison Multa said to us: “You know jewellery is central to us traditionally. Jewellery is everything. It is probably THE most important art form.” Jewellery has very strong significance ceremonially and hairstring was used in love magic and things like that. So it is very powerful. But it was also used just more simply as body adornment, so it can be made as secular art, which works perfectly in a contemporary art context, where it can be publicly shown, and of course sold, and there is no issue with transgressing law or anything like that. These artists are already working in a fine art context with their other mediums, particularly in weaving, painting, ceramics and printmaking. So this is not new to them in that sense. I think they feel similarly to me; that jewellery hasn’t been given its due and it is something that needs to happen. Some of the young leaders we have like Marissa Thompson and Anne Thompson who are very brilliant young women are really driven to do this more fine art work with jewellery. Marissa in particular identifies as being a jeweller, she has made jewellery since she was a little girl; she has a huge passion for it. People really enjoy making it. So if they can do that as a serious career, instead of here and there, it will be fulfilling and open up new doors for them. Emily McCulloch Childs is an art historian & writer, curator, gallery director, publisher and researcher. 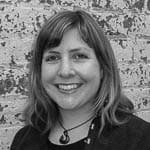 She specialises in Indigenous art, and has worked with Aboriginal art and artists since 1994. She is co-director, with her mother Susan McCulloch, of McCulloch & McCulloch, a multi-faceted art company, and Whistlewood Gallery, on the Mornington Peninsula, and is the founding curator of The Indigenous Jewellery Project. She lives on the Mornington Peninsula, Victoria. 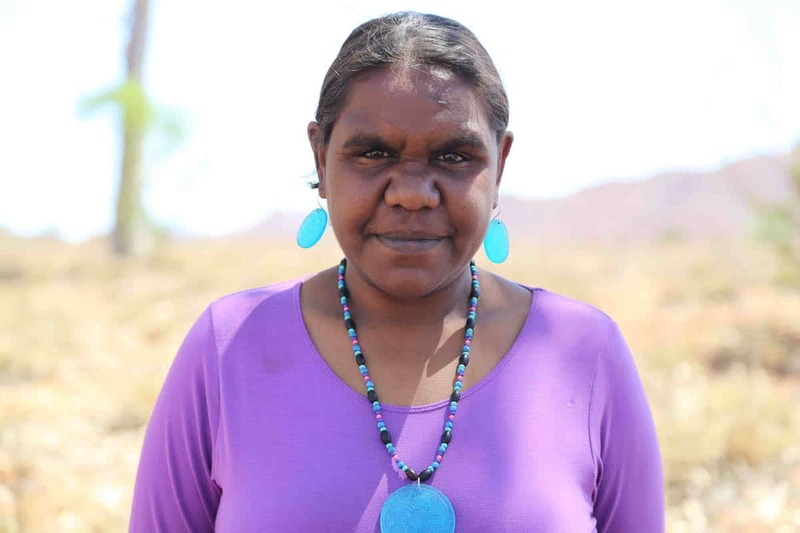 Marissa Thompson is a young Pitjantjatjara artist. 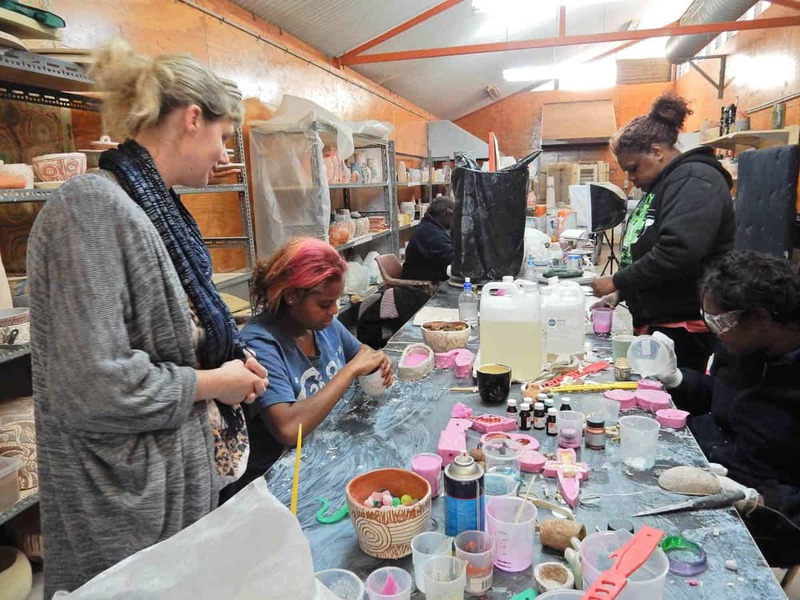 The daughter of Ernabella Arts board member and former Chairperson, artist Carlene Thompson, her father Kawaki Punch Thompson was prominent in the APY Land Rights Movement, and her cousin is the significant ceramicist Derek Thompson. 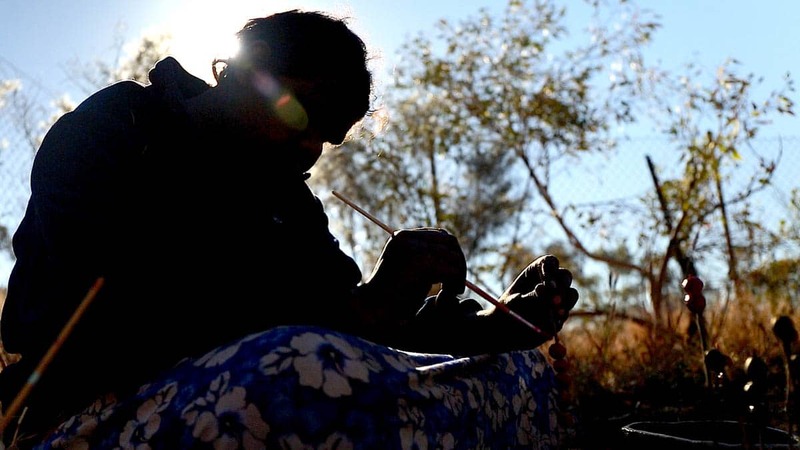 As a child, Marissa was fascinated by traditional Anangu jewellery techniques and making, and studied these skills with her grandmothers who were elder jewellers. Her jewellery work in the medium of resin includes necklaces using a variety of natural seeds, and seeds cast in resin, earrings and pendants. Her subject matter consists of totemic ancestral figures such as a small, local lizard and the well-known Ernabella walka design, etched into pendants and rings. Her skill at piercing ininti for necklaces is adept and remarkable in one so young, and her jewellery practice now extends to working not only in resin but also lost-wax design for silver and other metals. We provided some questions for Marissa which were asked by Hannah Kothe, manager of Ernabella Arts. Where does the design come from and who does it belong to? The design is referring to that kind of tree that has small little bean pods hanging from it. The old ladies use to paint this shape longways. With the help of a senior artist, Tjunkaya Tapaya, Marissa was able to identify the kind of tree she was referring to. Tjunkaya advised us that there are several kinds of trees that have these pods. In Pitjantjatjara the names for them are watarka, wakalpuka, ngatunpa and wanari. In English they are known as acacia or wattle trees. One variety is called Colony wattle or acacia murraynana. Traditionally the pods were moistened with water to make them soft and then ground to make a paste and eaten. Marissa said she decided to change the original design used by the old women and create a walka where the bean leaf/pod went around in a circle. It is about country, the plants and the animals and how life goes round and round in a circle and everything is connected to each other. Would you like to make more of these? Yes, I enjoyed designing this work and creating this walka. I would really like to keep on going with it, to make more earrings and necklaces and other jewellery. What a fabulous and interesting article, as an aboriginal artist I am always keen to explore new mediums. I will be researching aboriginal jewellery having now read this article. 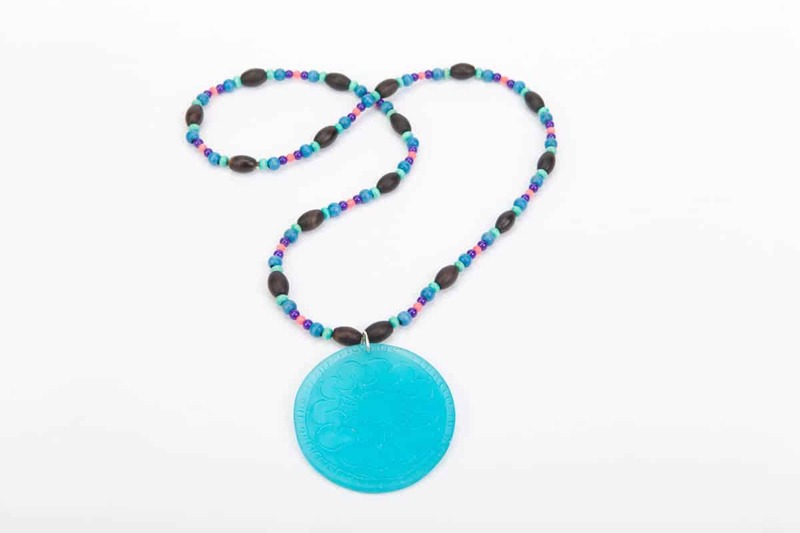 We have one of the oldest necklaces ever found from this country, Exmouth WA, it is important and significant in documenting aboriginal life on the North West Cape. This is a fascinating, wonderful project, and I’m so pleased to hear about it! Thanks so much for the article. Amazing project, thank you I found this a fascinating and celebratory read.